You know TMC as a global media company reaching millions reporting on technology and communications. What you may not know is that in our spare time - and yes, every now and then we get some of it, we like to write applications to make your life easier. 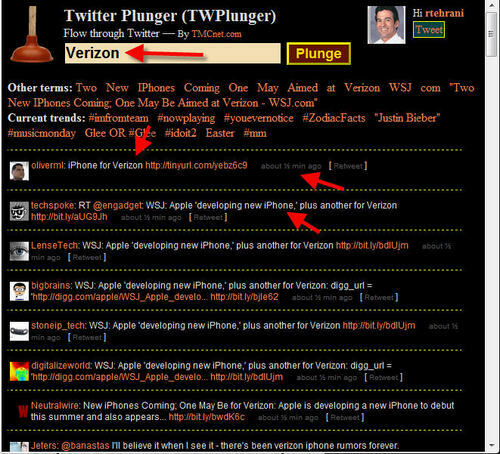 Case in point is Twitter Plunger, a new Google Chrome Extension allowing you to instantly search Twitter for all news related to whatever web page you happen to be on. 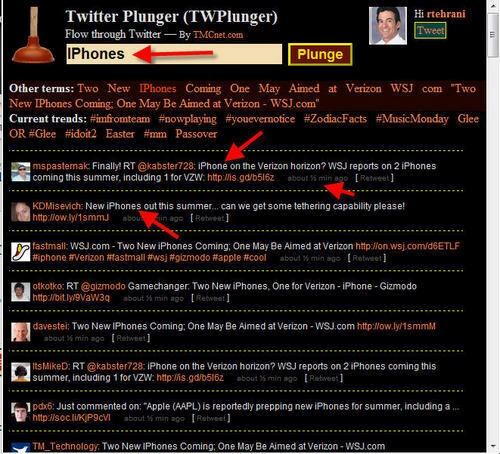 When you click on the plunger icon you are immediately presented with (plunged) results based upon the first word of the title tag of the page you are on. In addition, you are presented with other terms from the title tag. You can choose to click on any of the terms you like and when you do, you are instantly presented with an up-to-date Twitter feed for that topic. At this point you can choose to retweet any of these entries - or alternatively you can tweet something new from within the app. 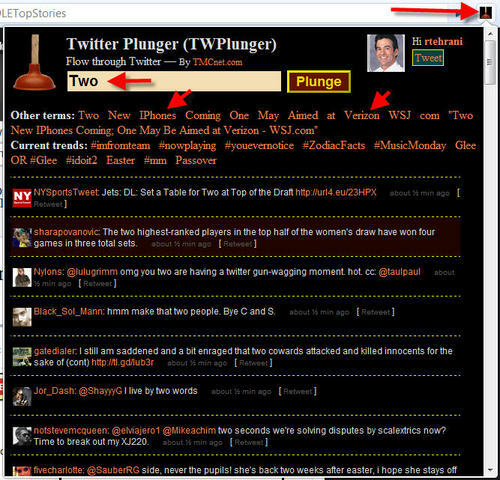 Keep in mind, you need to be logged into Twitter from within Chrome and also login via the Twitter Plunger extension. We have been really enhancing the functionality of this app lately and are thrilled to present it to the world at no charge. 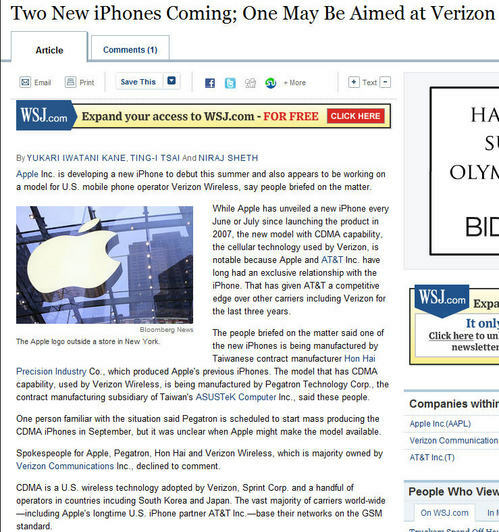 We hope it makes your web surfing more useful and you let others know about this nifty new tool. Depending on demand we may bring this program to other browsers so try it out and let us know what you think. Room for improvement feedback is appreciated. Feel free to click on any pictures below to enlarge them. A typical example of how you use the program is when you are reading something interesting and want to learn more. Here is an article referring to iPhones coming to the Verizon network for example. 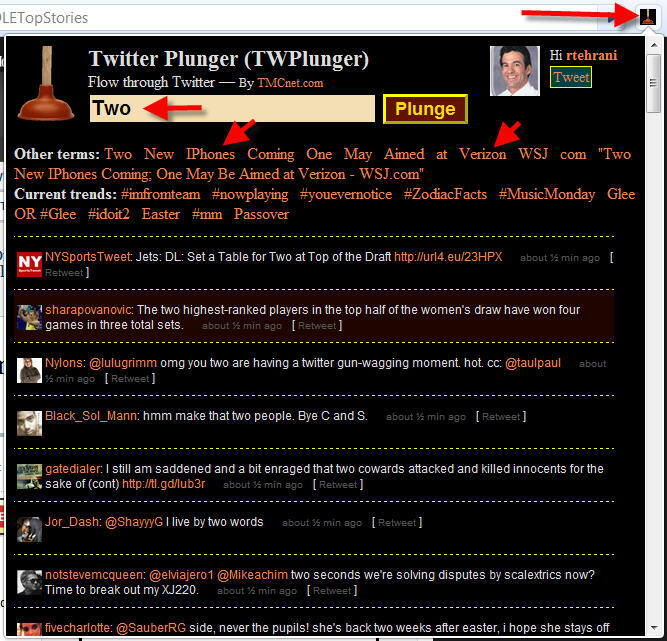 In this case, when you click the plunger, the immediate search result is for the word "Two" and this isn't that useful. 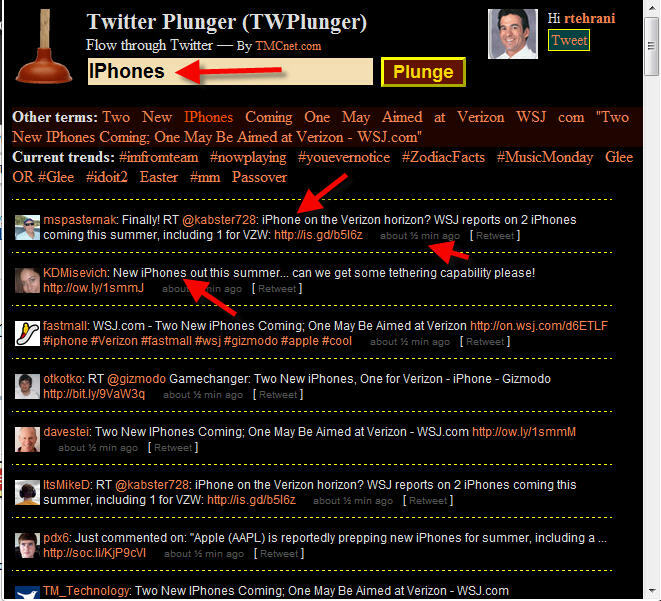 You can click on other terms at this point or type a new one or click on current and trending Twitter topics. For example, if you click on iPhones you are presented with immetiate tweets about iPhones. You could also click on Verizon and the tweets immediately shift to ones mentioning this carrier.